Just in time for Easter and all the festivities, my favorite post this week came from Eat, Drink & Save Money with their post, Shaving Cream Dyed Eggs. Dipping eggs into vinegar and colors can be difficult and messy for small children, but this post shows an alternative way to dye your eggs with shaving cream. Super fun and cute idea. Be sure to visit my Featured Blogger board on Pinterest. Home & Blogging: The kids went back to school this week, and I worked hard trying to get my house back in order– laundry, cleaning bathrooms, vacuuming and mopping floors. I also finished filing our taxes and working on the newsletter for the kids’ school. I’m exhausted just thinking about it. However, I did take some time for myself and got my hair done, and I was still able to write one blog post about an easy protein ball recipe. April 7 is World Health Day, and for every week in April I am going to share a healthy snack recipe on my blog. I’m currently recruiting people for Team Fit Triangle Mom for the Komen Race for the Cure held in Raleigh on June 13. My goal is to raise $3,000 by partnering with local businesses, selling team t-shirts and asking for donations. If you are local, I would love for you to join the team as a runner or walker. If you are unable to attend, you can donate to this wonderful cause. Click Here to learn how to get involved. Now It’s Your Turn to Share Your Favorite Posts and Small Victories! Grab this image & code! Linkup Rules: * Following your hosts is not required but appreciated! * Grab the Small Victories Sunday button and place it in your sidebar or the post you are linking up. *Share up to 3 of your favorite blog posts you want to share. Enter your link below and let’s celebrate our small victories together! *Please visit at least 2 others for every link you enter. This linkup only works if we support one another, your visits are crucial to fellow participants. *By linking up, you are giving the hosts permission to share your post on their social media pages to let others know of your awesomeness too! *By linking up, you are giving the hosts permission to email you notifications when the linkup is open. Your email addresses are not shared and you can unsubscribe to emails at any time. 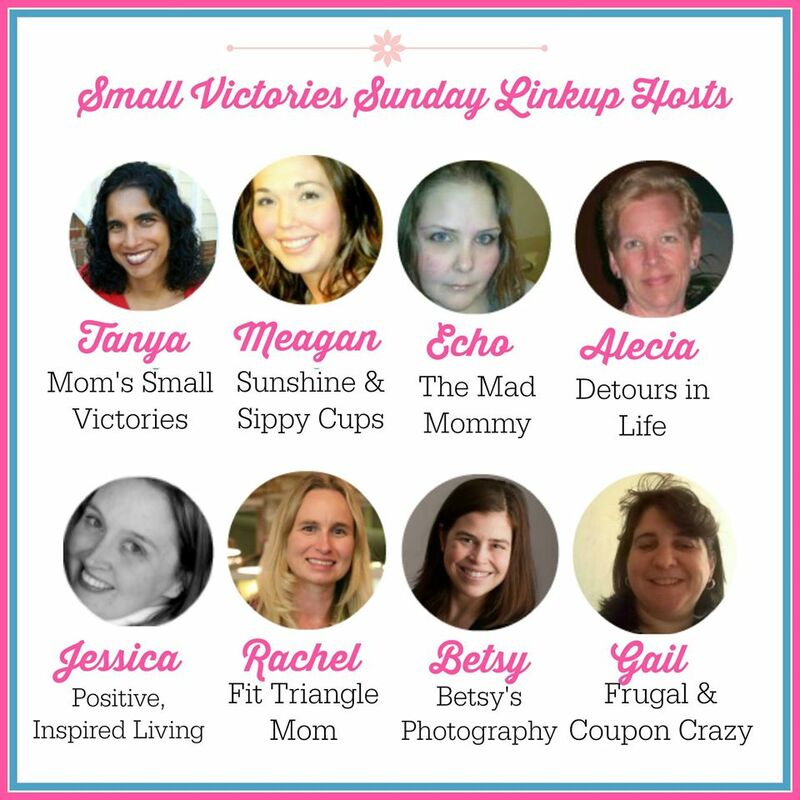 *Stop by our Small Victories Sunday Linkup Board on Pinterest and like and repin the posts to your boards. *Spread the word! The more you share about the linky, the more visitors you will get to your content too. Please use the #SmallVictoriesSundaylinkup hashtag so we can find your posts and share them too!